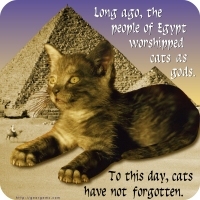 “Long ago, the people of Egypt worshiped cats as gods. To this day, cats have not forgotten.” This design, depicting an oversized kitten posed in front of the Great Pyramids, is sure to get a smile from Egyptologist and ailurophile alike! Get this great image on a t-shirt, bag, mug or other fine apparel or giftware item, exclusively from GearGems.